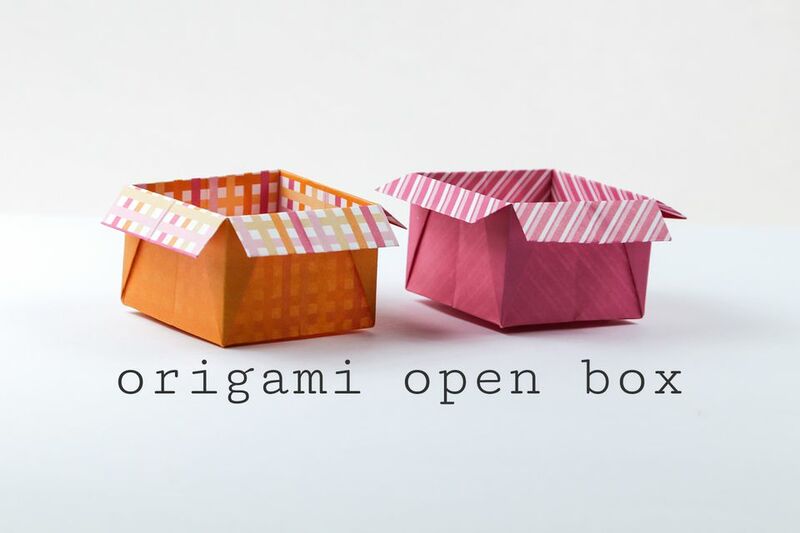 Learn how to make a pretty origami box, which makes a great display box for jewelry, stationery, and gifts. You will need one sheet of square paper for this one. For the nicest effect, use paper that has a different color or pattern on each side. We'll start by make a preliminary base or square base. 1. Start white side up, this color will be on the inside of the box. Fold the paper in half top to bottom, and right to left. 2. Flip the paper over to the other side. Fold the paper diagonally in half both ways. 3. You are now left with this. 4. Grab onto the left and right sides of the paper, and push them together. 5. Collapse the paper until it's a neat square. 6. Make sure the open corner is at the top. 7. Fold one layer down to the bottom. 8. You only need a small pinch mark. 9. This is the little mark. 10. Fold one layer from the right to the where the middle line and the pinch meet in the center. 11. Fold the other side. 12. Flip the model over and repeat. 13. Fold the top flap down to meet the center, and do the same on the back. 14. Flip the flaps to the sides that is plain. 15. Fold the top flap down to the middle. 16. Flip the flaps back to how it was in step 13. 17. Fold the little flaps to the edges. 18. You can see the right side is folded. 19. Open out the flap and push it. 21. Repeat on the other side, then flip it over and repeat on the back. 22. Open out the top flap. 23. Fold the top to the first crease. 24. Re-fold the top flap. 25. Now fold the flap, to match the horizontal edge of the flaps behind. 26. Take the right flap and fold it behind. 27. Do the same on the left side. 28. Repeat on the back flaps. 29. This should be the result. 30. Open out the flaps and fold the flaps the same way as step 22. 31. Fold the bottom point up. You can fold this crease in the other direction, to make a more defined line. 32. Open out the box. 33. Push the box open from the inside. 34. Straighten out the bottom edges. How To Make A Pretty Origami Blossom Flower! How to Make a Business Card Case From Paper!